The National Bureau of Economic Research has released a new book, Social Security Policy in a Changing Environment, edited by Jeffrey Brown, Jeffrey Liebman and David A. Wise. As you may know from my endless rantings, I've argued against the claim that rising per capita health care costs are – in OMB direction Peter Orszag's words – the "real deficit threat." Rather, simple population aging will for the next several decades be the largest driver of rising entitlement costs. If so, this undercuts the administration's case that the only way to save Medicare and Medicaid is to exert increased control over private sector health care for working age Americans in order to, at least in the administration's hopes, reduce health cost growth. Aging is the more important factor over the next 25 years or so. If the interaction is allocated between the two factors, aging accounts for about 64 percent of the projected growth in spending on the major entitlements by 2035. That result is not surprising because the aging of the baby-boom generation significantly expands the number of Medicare, Medicaid, and Social Security beneficiaries. Over the longer term, however, the situation reverses: 56 percent of the growth in total federal spending for those three programs by 2080 is attributable to health care costs per person rising more rapidly than per capita GDP. My view is that while health care inflation is indeed the largest cost driver in the long run – here meaning, from around mid-century onwards – you first have to get through the short and medium terms. And in the next four decades aging-generated entitlement spending increases will generate so much additional debt that a budget crisis is very likely to occur. In that case, the predominant role later played by excess cost growth gets to be a bit academic. What this means for the current debate is that the administration's focus on reforming private sector health care in order to fix Medicare and Medicaid is misplaced, even aside from the legitimate questions raised by others regarding the effects of these reforms. Even if the administration's health reforms were successful beyond their already-optimistic aspirations, if they don't confront the true drivers of entitlement costs it's unlikely they'll fix the problem. 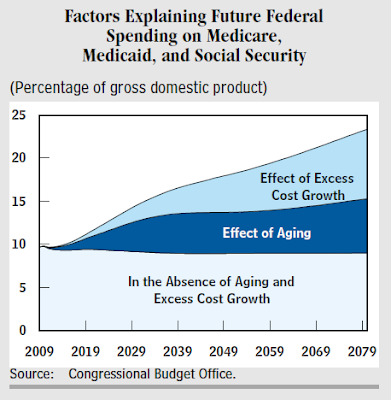 Also check out this post from the Committee for a Responsible Federal Budget, which gives a good explanation of aging versus excess cost growth issues. Should you claim Social Security benefits earlier if your life expectancy is shorter than average? I don't think so. U.S. News & World Report's Emily Brandon discusses a number of different Social Security claiming strategies. Check out the details here. It's a good summary of the current literature on claiming strategies, which is developing rapidly. Benefit checks increase by about 7 to 8 percent for each year you delay claiming up until age 70. Retirees who sign up at younger ages get smaller payments over a longer period of time, while those who wait get larger checks for their remaining years. "I would argue they would be better off claiming later because then they get a higher benefit and because you are getting more insurance against outliving your assets because Social Security benefits last as long as you live," says Andrew Biggs, a resident scholar at the American Enterprise Institute and a former deputy commissioner of the Social Security Administration. Of course, if you have a reason to believe you won't live a long life, it's best to sign up right away. It's the last line, which I've italicized, that I question. Let's say you're part of a group with known lower-than-average life expectancies – say, African American males. 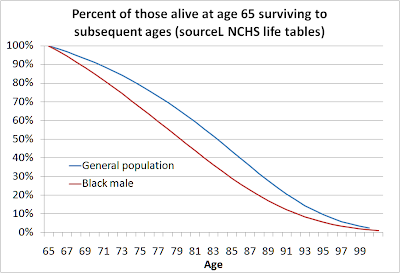 You know that while a typical 65 year old might live to age 83, an African American male on average lives to only 80. On average, then, you'll collect benefits for fewer years. But here's the key: you still have a lot of uncertainty regarding how long you'll live and a higher Social Security benefit protects you against that uncertainty. The chart below, which I put together from life tables from the National Center for Health Statistics, shows that average life expectancies have only limited value; the range of outcomes also matters a lot, but people don't think very much about them. For instance, a 65-year old black male has around a 10 percent chance of living beyond age 92 – for those individuals, a higher Social Security benefit would be of great value in holding off poverty in old age. Moreover, given standard economic assumptions regarding the utility of money, such that you'd be willing to give up some income today to prevent even a small chance of falling into poverty in old age, the case for even black males – the stereotypical low life expectancy group – to delay claiming Social Security benefits looks stronger. The broader point is that the choice you make shouldn't be premised on your life expectancy versus the average; what does it matter how long other people live? What matters is your own life expectancy and the degree of uncertainty surrounding that point estimate. The more uncertain your life expectancy is, regardless of the average value, the more a higher annuity payment will benefit you. Another issue to consider is benefits for your surviving spouse: even if you know you'll die young, by delaying benefits you guarantee a higher income for your spouse later in life. These issues are a lot more complex than some of the usual claiming strategies portray. People shouldn't think of choosing their claiming age as a game in which they hope to survive to some "break even age" and then "make money" afterwards. Choosing your claiming age is about making sure you have money when you need it the most. Unfortunately, this meant that the financial turmoil and ensuing economic crisis has had a major impact on private pension assets-OECD estimates that these have plummeted by US$5.4 trillion globally, 20% of their value. Countries where pension funds were heavily invested in equities, such as Ireland and the US, faced the heaviest blows. No wonder confidence in private savings is being sorely tested and there are calls to return to what is seen as the "safe haven" of government pensions. Yet there are many problems and dangers with making such a reverse turn. First it should be noted that pensions are long- term investments, and we should not make decisions affecting decades based on one year's results. Unlike the problems in the banking and insurance sectors, the decline in pension assets does not have short-term implications for most of us, and should recover over time. Indeed, despite recessions and bursting bubbles, over the last few decades balanced portfolios in OECD countries have earned an average 7% per year in real terms. Even if we do find it hard to trust markets again, huddling back under the shelter of public pensions is not an option. For one thing, public pensions have also been impacted by the crisis, as unemployment rises and tax takes decline, reducing contributions to the system and adding to already stretched government deficits. Another key reason is the cost pressures arising from an ageing society, as the disproportionate ratio of retirees to workers will continue to strain government budgets. When most of these pension systems were introduced the retirement age was 65. But then, life expectancy was also 65. Now we might work for 30 years and be retired for 30 years. Public pensions alone are no longer the answer, and for most countries a mix of both public and private pension schemes is probably where the future lies-security through diversity is the key. Last month, the media flashed the latest grim news on Social Security: Its trustees had concluded that the money pouring out of the system will start exceeding the tax dollars flowing in by 2016, a year earlier than previously forecast. Unreported, however, was a curious fact: The calculations effectively deny the existence of a longtime trend that probably will delay the arrival of Social Security's doomsday. That trend is Americans' growing propensity to work beyond traditional retirement age. In doing this, the agency could be making a $200 billion mistake in its assessment of Social Security revenue over the next 10 years. That sum is the likely unanticipated income from payroll taxes levied on older workers who remain on the job, based on the projections of demographer Peter Francese, who has had an excellent record predicting such trends. A hundred billion here, a hundred billion there, and pretty soon you're talking real money -- enough to keep this system in the black until at least 2018. While such a delay might not sound too impressive, it does give Washington two more years to come up with a viable solution for the nation's most sacred entitlement program. Overall, I suspect that Epstein may be overestimating increases in labor force participation by older workers and underestimating the degree to which the Trustees already include data on the current upsurge in work by older Americans. In any case, even Epstein isn't arguing that this will cause a significant delay in Social Security's coming deficits. The issue of labor force participation by older individuals came up during the deliberations of the 2007 Technical Panel on Assumptions and Methods. As I recall, many on the panel argued that labor force participation by older workers would rise, such that over 75 years the labor force participation rate of people in their late 60s would rise to that of folks in their early 60s today, but I don't believe the panel as a whole made such a recommended change in assumptions. In any case, the increases Epstein is arguing for go well beyond this. In the Senate Aging Committee hearing yesterday, there was considerable support expressed for increasing the Social Security taxable maximum wage – currently $106,800 – to cover 90 percent of total earnings as a means to increase revenues and improve the program's solvency. The following are thoughts that occurred to me as the lone witness who wasn't so hot on the idea. As the Economic Policy Institute's John Irons argued at the hearing, the payroll tax covers a smaller share of total earnings today than it did in the early 1980s. But if you look at the chart included in the addendum to my testimony, the current coverage level – around 85 percent, according to the 2009 Trustees Report – isn't out of line with the program's history. On average, the payroll tax cap has covered around 84 percent of total earnings, making today's level just about on par with past practice. Moreover, while the tax max covered 90 percent of total earnings in the early 1980s – not as a result of the 1983 reforms, but from changes made in the 1977 reforms – it's not at all clear that Congress explicitly targeted 90 percent. There is one after-the-fact reference in a committee document to 90 percent, but past discussions with the SSA historian Larry DeWitt indicate that this link is pretty hazy. The conclusion here is simply that we shouldn't assume, as some seem to, that 90 percent coverage by payroll taxes is a historical norm we must adhere to. Raising the current tax max of $106,800 to cover 90 percent of total wages would mean increasing it to around $172,000, according to the SSA actuaries. (Interestingly, this 2009 figure is much lower than it would have been under 2008 projections, due to significant shrinkage of earnings above the cap. Had the recession not occurred, the 90 percent coverage figure would have been around $214,000. I guess we've fixed the income inequality problem…) A single person earning $107,000 pays a marginal tax rate of 28 percent; if married, the effective marginal rate may be higher, since taxes are levied on the couple's earnings. The typical person also pays a state income tax of 6-7 percent, so we've got a current total marginal tax rate of around 35 percent. If we raise the tax max and pay extra benefits on those taxes, the effective marginal tax rate rises to a little over 45 percent. Because extra benefits are paid, the "net tax" is around 10.5 percent, rather than the full 12.4 percent statutory payroll tax. Nevertheless, the idea that a person earnings a little over $100,000 should pay nearly half their income to the government – and this, before we've even touched Medicare and Medicaid reform – just seems to high to me, from an economic standpoint, from the standpoint of fairness between different earnings levels, and from the standpoint of the relationship between a supposedly limited government and those who support it. For some earning more – say, near the new cap level of $172,000 – the marginal tax rate could exceed 50 percent. That's just too much. Lifting the tax max will tend to reduce work effort by those affected. It's a bit complex, since there are both income effects that can push them to work more – the tax reduces your income, and you may work harder to make up the loss – and substitution effects that will cause them to work less – that is, since the next dollar of earnings brings you less after-tax income, you won't work as hard. For someone right at $107,000, there's no income effect but a big substitution effect; in that area, people will work less. From $107,000 to the new cap, it will be a mix, although I'd wager that the substitution effects will generally dominate. At earnings levels above the new cap there's no substitution effect, so people may work more. How much more, we don't know, and in any case this is a very small number of people. The alternative, reducing future benefits, will almost surely increase labor force participation and personal saving, as people try to make up the difference. Given that almost all reform plans will protect true low earners, it seems to me we should opt for one that would help the economy rather than hurt it, particularly given all the other economic challenges we face. Even assuming the decline in the tax cap from 90 percent to 85 percent of total earnings matters, that decline was driven almost entirely by increased earnings at the very high end – not of people making $170,000, but $1.7 million or $17 million. Essentially, the person making $107,000 to $172,000 is paying the tab for something that really has nothing to do with him. I'm not so keen on President Obama's proposals for a surtax on earnings above $250,000, but it at least targets the source of rising inequality. $107,000 is a good salary, but for people in a place like New York City it's hardly upper class – for comparison, it provides the same standard of living as a person earning around $53,000 in Milwaukee. Good, sure, but this is hardly the realm of private jets, or even private schools. A lot of these high earners will be clustered in high costs cities. I have no special favor for New York City, but we shouldn't be confused that these are folks in limousines. Finally, this proposal is a bit out of character from the traditional structure of social security as designed by President Roosevelt. Roosevelt was strict in saying that Social Security should not resemble "welfare," that it should be like a private pension plan. Social Security taxes were to resemble pension contributions, so there would be no stigma on people who received benefits and no resentment from higher earners for the taxes they paid. Roosevelt wanted people to feel ownership in their benefits by virtue them being paid for by workers' own contributions. It's worth mentioning that when Roosevelt's Committee on Economic Security first drafted a social security plan, high earners wouldn't even have been included in the system – there would have been no redistribution from very high earners to everyone else. So to pin the whole burden of restoring solvency on higher earners seems out of step with how the program has functioned over time. There's broad-based agreement as to the major elements of what's needed for Social Security reform: to strengthen the benefit for people near the poverty level; to provide less replacement income for middle- and upper-income workers; to gradually increase the retirement eligibility ages in installments over time to encourage people to work longer and to index those ages to increases in life expectancy; to increase the taxable wage base cap. The Social Security tax is the most regressive tax that we have. Other changes include to possibly consider a very modest modification to the post-retirement cost-of-living increase and to consider an add-on supplemental savings account. If you did all of those things, you could provide for a solvent, sustainable, more savings-oriented Social Security system indefinitely. I have a new paper in AEI's Retirement Policy Outlook series that examines what I call the "predictability risk" of Social Security benefits – put simply, the risk that your retirement benefit will turn out to be different from what you thought it would be. This is more important than you'd think, since Social Security's benefit formula is so complex that the typical person could never figure out their benefits on their own. Unlike simpler corporate DB plans, it's pretty much impossible to guestimate your benefits "on the fly." To examine this issue, we used the Health and Retirement Study, which includes both questions on how much you think you'll receive from Social Security and how much you are actually receiving. Using people who responded to more than one wave of the study, we could compare what near-retirees thought they'd receive one to two years prior to claiming to what they actually got when they retired. About one-quarter of HRS respondents couldn't even hazard a guess as to their benefits. Of those who did make an estimate, their guesses were very close on average – but there was a great deal of disparity. Many people overestimated their future benefits, while many people underestimated them. Both guessing low and guessing high have a cost, but overestimates obviously are more damaging for retirement income security. One-third of near-retirees overestimated their benefits by at least 10 percent, while one quarter overestimated them by more than 28 percent. One in ten retirees received a benefit less than half as much as they expected. This predictability risk is every bit as damaging as having your 401(k) account decline on the verge of retirement. A number of policies could help. First, better publicity for the Social Security Statement, which appeared to improve people's knowledge when it was first rolled out in 1995 but doesn't seem to do as well today. (I have some ongoing research on this issue, so I'm not yet ready to say how well the Statement has really done.) Second, new sources of benefit estimates, such as the SSA's new online benefit estimator. And third, and probably most importantly, simplifying the benefit formula as part of a larger Social Security reform. Kimberly Palmer of U.S. News & World Report talks about Social Security and young Americans. I spent the morning at the Youth Entitlements Summit on Capitol Hill, where 20-somethings quizzed economists about the future of Social Security, Medicare, and the financial security of our country. I left feeling like young people have a lot to worry about. I believe it will be possible to watch the hearing online at the Aging Committee's website. Read more! Given what appears to be clearly bad news, are there reasons to be upbeat, especially with regard to Social Security? Happily, there are. Despite years of propaganda suggesting that Social Security is doomed and that younger generations will never receive back a dime of the money they are paying in, it remains true that the only thing we need to maintain a healthy Social Security program well into the future is political will. We can and should continue to support this important program – especially now that we have seen what can happen to our private pensions, 401(k)'s, and savings accounts when the economy takes a negative turn. Much of Buchanan's piece is fine and really just a difference of values: he values certain things more than I do and others less. First, he tries to cast doubt on the Trustees projections by comparing their projected future GDP growth rates to those of the past. As I've argued in a number of places (and as CBO made clear here) these comparisons are silly because they don't account for the fact that lower birth rates, which we are already experiencing, will reduce future labor force growth which will reduce future GDP growth. Future productivity growth and individual wage growth will be right around the historical average. The fact that so many on the left continue to make these arguments despite such a simple counterargument strikes me as sloppy, at best. Second, Buchanan points to the high and low cost projections to argue that we shouldn't take the Trustees' intermediate cost projections – their "best guess," as it were – too seriously. The Trustees (and even more so CBO) are very open about the uncertainty of their projections. But uncertainty isn't a reason to delay action but to act sooner, since things could as easily turn out worse than projected as better. (The case for acting today on global warming, for instance, rests almost entirely on the uncertainty of future projections; if the projections were certain, the most likely conclusion would be to let rich future generations build dikes.) As an econ Ph.D., Buchanan should know that the welfare value of averting an unlikely but nasty future event outweighs the cost of insuring against something that doesn't come to pass. Third, Buchanan jumps on the train saying the problem isn't Social Security but Medicare, and that the Medicare problem is just rising health costs leaking over from the private sector. As this post showed, even the administration's own projections show that population aging – something that affects government programs far more than private sector ones – is the real entitlement cost driver. In any case, worth a read to get perspective. The 2009 Social Security and Medicare Trustees Reports show the combined unfunded liability of these two programs has reached nearly $107 trillion in today's dollars! That is about seven times the size of the U.S. economy and 10 times the size of the outstanding national debt, says Pamela Villarreal, a senior policy analyst with the National Center for Policy Analysis. The unfunded liability is the difference between the benefits that have been promised to current and future retirees and what will be collected in dedicated taxes and Medicare premiums. Last year alone, this debt rose by $5 trillion. If no other reform is enacted, this funding gap can only be closed in future years by substantial tax increases, large benefit cuts or both, says Villarreal. When today's college students reach retirement (about 2054), Social Security alone will require a 16.6 percent payroll tax, one-third greater than today's rate. When Medicare Part A is included, the payroll tax burden will rise to 25.7 percent -- more than one of every four dollars workers will earn that year. If Medicare Part B (physician services) and Part D are included, the total Social Security/Medicare burden will climb to 37 percent of payroll by 2054 -- one in three dollars of taxable payroll, and twice the size of today's payroll tax burden! Thus, more than one-third of the wages workers earn in 2054 will need to be committed to pay benefits promised under current law. That is before any bridges or highways are built and before any teachers' or police officers' salaries are paid. The Social Security and Medicare deficits are on a course to engulf the entire federal budget. If our policymakers wait to address these growing debts until they are out of control, the solutions will be drastic and painful, says Villarreal. Jed Graham writes for Investors Business Daily that the costs of fixing Social Security may be higher than commonly understood, since it's likely that we'll borrow most of the money needed to repay the Social Security trust fund. In following years, we won't merely need to address Social Security's annual shortfalls – which themselves will be in the hundreds of billions of dollars – but the interest costs on debt accumulated up to that point. Crunching the numbers in the 2009 trustees' report, including economic projections, shows that the extra interest costs from redeeming the trust fund bonds alone would average 1.6% of GDP from 2037 to 2083, assuming that interest payments are paid for with more borrowing. If the government were to pay all unfunded benefit promises in 2037 and beyond while covering interest costs on the trust fund-related public debt, that would soak up 2.9% of GDP, on average, from 2037 to 2083. Although the features of Clinton's health care reform and Bush's Social Security reform were quite different, I believe they failed for the same reason: crowded politics. In both cases, the overwhelmingly number of groups and individuals interested in the issue created a paralysis, ultimately leading to the reform's downfall. Gone are the days when policy design was negotiated and controlled through small Iron Triangles consisting of the relevant executive agency, the congressional committees of jurisdiction, and at most a handful of interest groups. Since the 1970s, the number of associations has more than doubled, the number of lobbyists has quadrupled, and the number of think tanks has grown six fold. Meanwhile, academics, politicians, and private citizens have become more interested and informed in a wider array of policy areas. Normally Paul Krugman, the liberal pundit and Nobel laureate in economics, and Paul Ryan, a conservative Republican congressman from Wisconsin, share little in common except their first names and a scorching passion for views they champion from opposite political poles. So when the two combatants agree on a fundamental threat to the U.S. economy, Americans should heed this alarm as the real thing. What's worrying both Krugman and Ryan is the rapid increase in the federal debt - not so much the stimulus-driven rise to mountainous levels in the next few years, but the huge structural deficits that, under all projections, keep building the burden far into the future to unsustainable, ruinous heights. Debtor Nation: The Threat To America's Future. A panel discussion moderated by Marjorie Rose, Senior Lecturer, Department Of Economics, Dartmouth College. With the budget deficit soaring toward a record $1.8 trillion, the Obama administration is planning to propose tough new rules that would require lawmakers to pay for new initiatives -- including an overhaul of the health system -- or face automatic spending cuts. …If approved by Congress, the rules would forbid lawmakers from expanding entitlement programs such as Medicare and Social Security, creating new entitlement programs or cutting taxes unless the cost is covered by spending cuts or tax increases. If lawmakers fail to pay for their initiatives, Obama's rules would subject entitlement programs to automatic cuts, said sources who spoke on condition of anonymity because the plan has yet to be announced. The National Academy of Social Insurance will hold a conference, The Quest for Adequate Retirement Income, on June 17, 2009 from 3:00pm – 5:00pm at the National Press Club, Washington, DC. How are 21st century seniors faring in retirement? What are reasonable goals for wage-replacement? To what extent are retirees achieving those goals? 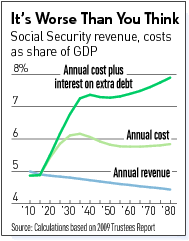 What is the trajectory for Social Security and retirement income adequacy in coming years? What are the implications of recent developments in pensions, savings, 401(k)s, home values, and jobs for the retirement security of boomers and those who follow them? What Does It Take to Make Ends Meet? What insights can be drawn from new research on measuring economic security for seniors? How does current research help policy makers set retirement income goals? What insights can we draw from new work on an Elder Economic Security Standard in the United States, efforts to update the official poverty thresholds, and international measures of income adequacy (or inadequacy) for families and seniors? Which groups are most at risk of having inadequate incomes in old age? Which groups are most reliant on Social Security? Why is it important to address the adequacy of Social Security benefits for low-income workers, families, and elders as part of achieving long-term solvency in Social Security? Observations on the quest for adequate retirement income in today's policy environment. China looking to hedge its dollar risk? With record federal deficits and debt-to-GDP ratios rising, Chinese government officials – who hold around a tenth of the total U.S. public debt – are apparently getting concerned that a dollar decline could leave them holding the bag. The U.K. Telegraph reports that the director of China's number two bank said the U.S. government should start issuing bonds denominated in Chinese yuan. Unlike dollar denominated debt, debt issued in the currencies of former countries would face less risk in the case of dollar devaluation or inflation. Of course, the threat of outright default, or of assistance from the IMF, would increase. With debt-to-GDP ratios projected to rise to 85 percent and higher, it's becoming clearer that our foreign lenders are getting concerned about the U.S. fiscal gap, even if Congress and the administration seem somewhat less bothered. We know how to fix Social Security. We don’t know how to fix Medicare. So why not fix Social Security? Obama said fixing Social Security is actually one of his smaller challenges. "There are some problems that are really hard to solve," he said. "This is one we actually can solve." Here's the question: why does this justify ignoring Social Security in favor of health care reform? After all, as the administration's own health care plans show, we really don't know how to cut health care costs without impacting quality, much as we'd like to do so. Enacting reforms when we don't fully understand the problem obviously carries some risks. Social Security reform, as Obama stated, is far more straightforward; all that's really needed is political leadership. It would seem that's something the President could provide in order to get this very large problem out of the way. Over at AEI's blog, I talk about a new theme in the healthcare debate: criticizing the Congressional Budget Office for not crediting the Obama administration's proposed reforms with significant health care savings. I argue that CBO's skepticism of the cost-saving potential of reforms such as comparative effectiveness research, disease management and healthcare information technology is probably well-founded and their focus on getting the incentives right makes sense. Instead of bashing the CBO, health reformers on the left should think harder about setting up incentives so that the reforms mentioned above would actually save significant money. The Social Security Administration has made some improvements to the Social Security Statement, the annual benefit estimate sent to every worker each year. The first change is a mention on page 1 of SSA's new When to Start Receiving Benefits pamphlet, which I think is a much improved explanation of the pros and cons of delaying benefit claiming. In the past I'd thought there was a bias in SSA's procedures toward encouraging people to claim at 62. The new material is much more balanced and I think very informative. Second, in a bit of behavioral economics at work, the benefit estimates on page 2 now begin with benefits as of the Full Retirement Age rather than age 62, the age of earliest eligibility. People often gravitate toward the first thing they read, so it makes sense to make that the Full Retirement Age rather than earliest one, at which benefits can be cut by 25 percent for life. Click here to see a sample statement. Congrats to all at SSA who worked on this – a job well done. You've heard the joke: A physicist, a chemist and an economist are stranded on an island, with nothing to eat. A can of soup washes ashore. The physicist says, "Let's smash the can open with a rock." The chemist says, "Let's build a fire and heat the can first." The economist says, "Let's assume that we have a can-opener..."
I thought of this admittedly lame joke when I read Peter Orszag's post at the OMB blog discussing the Obama administration's health care reform plans, in which Orszag effectively assumes massive reductions in health care costs without specifying any plausible route by which these reductions would take place. As Orszag points out, there are two elements to Obama's health care plan: first, expansion of health coverage to reduce the number of uninsured; and second, measures to reduce the long-term growth rate of health costs, which threaten the budget and the economy. Orszag also accurately points out that coverage expansion would increase costs immediately while savings from reducing health care cost growth would materialize only over time. So far, so good. But here's the problem: nothing the Obama administration has proposed would come anywhere close to producing even the most modest cost savings discussed by Orszag. The Obama administration puts forward three principal health care reforms: information technology, particularly in the form of electronic medical records; disease management, which includes intensive follow-up of chronic diseases such as diabetes; and cost-benefit analysis to find the best treatments for the dollar. But as the CBO has repeatedly pointed out – see CBO director Doug Elmendorf's March congressional testimony for a summary – these reforms, while potentially improving health care treatment, are unlikely to do much to reduce costs and could potentially even increase costs. The key, Elmendorf stresses, is to get incentives right (the word "incentives" occurs 37 times in a relatively short document). The Obama administration is taking an "if you build it, they will come" approach, assuming that the simple presence of these reforms will cause health care participants to act on them. CBO's point, and that of many others, is that participants currently lack much incentive at all to focus on savings, so these reform won't affect their actions very much. These costs savings are what Orszag in his Social Security days called a "magic asterisk," money that materializes out of nowhere. Policymakers should be wary of "reforms" that offer spending increases in the here and now followed by cost reductions out in the mist.